France have been waiting for a new skiing champion for a number of years and it now appears clear the man to fill those empty ski boots has emerged in the form of slalom specialist Jean-Baptiste Grange. In just two seasons, the man from Valloire has become the man to beat in his discipline winning the World Cup slalom title in 2009 while he also flirted with the overall crown before fading towards the end of the season. The Frenchman completed the pre-Olympic year with six World Cup victories (5 slalom, 1 super-combined) and no less than 12 podiums. At 25-years-old, the sturdy skier (1.81m, 80kg) will now enter the starting hut at the 2010 Vancouver Games as a good bet for slalom gold while a medal in the super-combined is also a realistic possibility. It will be his second appearance at the Olympic Games after finishing 13th in the combined at Turin 2006 and failing to complete the slalom. 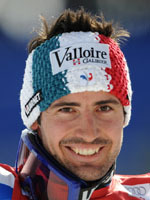 Since 2007, Grange has emerged as the leader of the French team when he won its only medal at the world championships at Are, Sweden where he took slalom bronze on the final day. He followed up with his first World Cup victory at Alta Badia just before two illustrious wins at Wengen and Kitzbuhel in the January to dovetail nicely with the bonus of victory in the super-combined at Wengen. Unfortunately for the Frenchman, the slalom crystal globe slipped from his grasp during the final race at Bormio when he was edged out by Italian Manfred Moelgg. Despite that setback, Grange grew from the experience and despite a poor showing at the 2009 world championships at Val d'Isere where he finished nowhere, he held his nerve in the final World Cup race to win his first individual slalom title. There is a rich skiing pedigree in the Grange family and his grandfather ran a local ski school at Valloire and his parents and uncle were members of the French ski team in the 1970's. "They all love competition and I've always grown up with this spirit," explained Jean-Baptiste. His older brother Francois-Cyril always gave him a run for his money when the two raced together as youngsters but Grange's career was nearly cut short at the age of 11 when he had serious back problems and spent a year in a corset. He always dreamed of being one of the best and willingly sacrificed socialising with friends to concentrate on new training methods. Studies were also put on the backburner as he devoted his career to the slopes. Grange is now not alone amongst the French hopes for Olympic glory and his good friend Julien Lizerouz will add to the team's chances when the battle for medals takes place at Vancouver 2010.